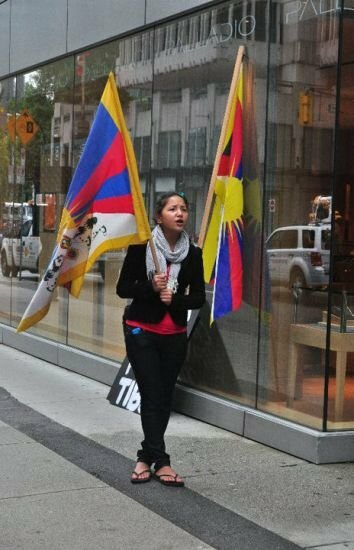 The 250-mile walk will end at the Chinese Embassy in Washington, DC on May 8, 2011 with a rally by hundreds of Tibetan-Americans and supporters. The marchers will also lobby their Representatives and Senators on the Capitol Hill to seek support for their demands. The march is co-sponsored by the Students for Free Tibet, New York-New Jersey Tibetan Association, Tibetan Women's Association and Tibetan Youth Congress. The Chinese government had started a brutal crackdown on the monks of Kirti monastery and the Tibetan population of Ngaba after a 21-year old monk, named Phuntog, set himself on fire on March 16th to draw the world's attention to China's extreme repression and continuing suffering of the Tibetan people. The occasion was the 3rd anniversary of the 2008 Tibetan Uprising during which hundreds of Tibetans were killed, including many from Ngaba. While the monk lay dying of his burns, Chinese police kicked and beat him, instead of helping him, in an act of unconciounable barbarity. Enraged monks from the Kirti monastery and local Tibetans spontaneously gathered in protest. Since then the Chinese authorities have surrounded the monastery with thousands of paramilitary forces and laid a siege to the monastery with food supplies and movement severely restricted. On April 21, the crackdown deepened with about 300 monks being taken in custody. Two elderly Tibetans died from beatings as they tried to prevent the monks from being taken away. Thinley Kelsang, who is an organizer for the march said: "We are deeply concerned about the ongoing situation in Ngaba. This is very deliberate plan by the Chinese government to destroy vibrant force that is Kirti monastery, a bulwark of resistance against Chinese attempts to destroy Tibetan culture and identity. The brutality inflicted on the monks and the general Tibetan population of Ngaba are intolerable." The Kirti monastery was established in 1870 by the 8th reincarnation of Kirti Rinpoche. The monastery is well known for its scholarships in Sutra and Tantric Buddhism. With over 2500 monks, it is one of the largest and most prominent is northeast Tibet. Earlier in February 2009, another monk named Tapey from the same monastery also self -immolated in protest against Chinese rule. Chinese police at the scene reportedly shot at his already brunt body and to this day, the Kirti monastery is yet to retrieve his body. 4. Urge United Nation to send a fact-finding delegation to Tibet.